A classic all over floral motif in a delicate shade of light French blue with a reverse pattern on the back, giving you the opportunity to completely change the look of a room with a flick of a duvet. Gentle yet robust, delicate yet strong this beautiful bedding is a work of art. This pair of oxford pillowcases is 50 x 75 cm approx. 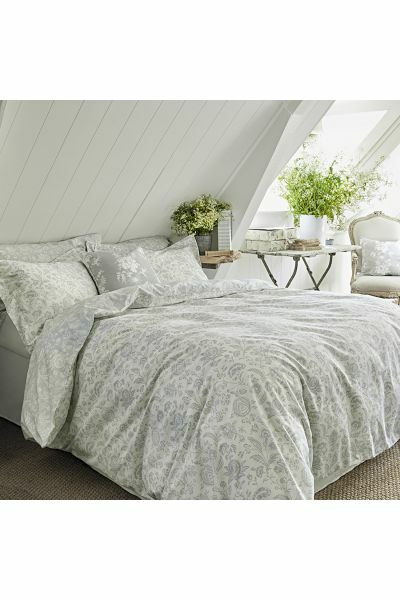 The Cabbages & Roses bed linen collection is made from 100% cotton, 200 thread count cotton percale which washes beautifully, is crisp and clean feeling and ages well with careful washing. Each design has a contrasting print on the reverse which makes the collection extremely versatile. CARING FOR YOUR BEDDING: CABBAGES & ROSES BEDDING CAN BE MACHINE WASHED. WE RECOMMEND USING ECOVER DELICATE LAUNDRY LIQUID. PLEASE DO NOT BLEACH. YOU CAN TUMBLE DRY BUT IF YOU HAVE SPACE, HANG TO AIR DRY. WASH DARK COLOURS SEPARATELY. DO NOT BLEACH OR DRY CLEAN. TUMBLE DRY ON LOW. WARM IRON. FOR BEST RESULTS IRON WHILST DAMP.